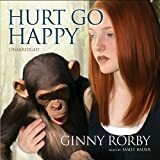 The hardcover of Hurt Go Happy was released in 2006, but it has just been released as an unabridged audiobook performed by Emily Bauer. The reader reviewers rave about the book on Amazon.com, and it has many admirable qualities. The lead character of this book for children is Joey Willis, a deaf teenager who fights with her mother about being allowed to learn American Sign Language. She makes friends with a old man who lives nearby, Charles Mansell. It turns out that Charlie has a pet chimpanzee, who, by a remarkable coincidence, does use ASL, and soon Joey is firm friends with Charlie and Sukari. This infuriates Joey's mother and leads to more battles, and we see how fiercely independent Joey can be. The book deals with a number of weighty issues: family arguments, the experience of deaf children, the relative usefulness of signing versus lip-reading for deaf people, divorce, spousal and child abuse, death and loss, the intelligence and emotional capabilities of chimps, and the treatment of chimps in research labs. The plot moves along quickly, and there's never a dull moment. Indeed, the succession of coincidences makes the plot wildly implausible. Rorby's portrayal of the signing chimp with an ability to create sentences with signs is also going to be controversial, given that there's no clear evidence that chimps are in fact able to do this (see Rivas, 2005) This is a shame because the book does a great job at highlighting the ethical abuses in the treatment of chimps in US research labs. Although this book was published 5 years ago, the issue continues. Just this month, the Great Ape Protection and Cost Savings Act of 2011 was introduced in Congress, aiming to end invasive research on chimps; the USA is the only western country that still allows such research, and there are currently about 1000 chimps currently being experimented on in US labs. Rorby's support of the cause for chimps is admirable, but the cause is not helped by exaggerating the capabilities of these primates. The performance of the audiobook by Emily Bauer puts emphasis on the emotional side of the story, but it works pretty well.